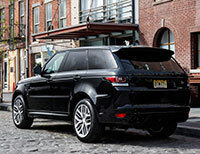 The Range Rover Sport is smaller and more nimble than the full-size Range Rover. The Range Rover Sport offers a third-row seat, but it’s tight back there. Think of it as a 5+2, not a seven seater. The 2018 Range Rover Sport benefits from a new interior and is distinguished from the previous model with revised styling in front and updated electronics including new twin 10-inch touchscreens that control every function. The top one does infotainment, Bluetooth and navigation; the bottom one does audio, climate, and driving modes. The Sport was redesigned for 2014 with a new riveted-and-bonded aluminum chassis, rigid and light, which transformed its handling to nimble, in a class of its own. Land Rover calls the new two-screen system Touch Pro Duo. It’s unique, and the display is impressive, big, flashy. The function is slick, and simple after it’s learned. The Range Rover Sport SE and Range Rover Sport HSE use a 3.0-liter supercharged V6 that develops 340 horsepower. The supercharged 5.0-liter V8 comes in two power levels. The standard 518-horsepower V8 powers Range Rover Sport Supercharged and Autobiography. The Range Rover Sport SVR unfurls 575 horsepower and 501 pound-feet of torque. All models work with an admirable 8-speed automatic transmission that can include paddle shifters. Even the V6 promises a snarly sound and 0-60 mph acceleration in 6.9 seconds. That 60-mph sprint takes a mere 5 seconds with a V8. The turbodiesel option uses a 3.0-liter V6 diesel that produces a muscular 443 pound-feet of torque. Acceleration is comparable to the gasoline V6, though not as responsive, and diesel owners can expect pleasantly quiet operation. The V6 is rated by the EPA at 17 mpg City, 23 Highway, 19 Combined. The EPA rates the V6 turbodiesel at 22/28/24 mpg. The supercharged V8 is rated at 14/19/16 mpg no matter whether it’s 518 or 575 horsepower. Safety features on all models include automatic emergency braking, lane departure warning, rearview camera, surround-view camera (not standard on SE or HSE), parking sensors, parking assist, and automatic high-beam headlights. An optional Driver Assistance Package adds blind-spot monitoring, adaptive cruise control, and traffic sign recognition that can display the current speed limit. Neither the National Highway Traffic Safety Administration nor the Insurance Institute for Highway Safety have crash-tested the Range Rover Sport. Range Rover Sport comes standard with the 3.0-liter V6 engine. 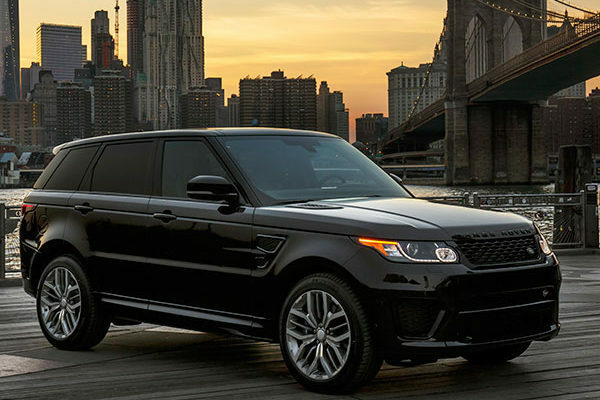 Range Rover Sport SE ($66,750) comes with leather upholstery, power adjustable heated front seats, an eight-speaker audio system, USB and Bluetooth connectivity, dual-zone climate control, a rearview camera, 19-inch wheels, and keyless ignition. SE Td6 ($68,750) substitutes the diesel powertrain. HSE ($72,350) adds 20-inch wheels, a panoramic sunroof, upgraded leather seats, more adjustability for the front seats, blind spot monitors, an 11-speaker audio system, parking sensors, and LED headlights. HSE Td6 ($74,350) gets the diesel. HSE Dynamic ($82,150) gets and additional 20 horsepower, along with 21-inch wheels, red brake calipers, a leather-wrapped steering wheel, 22-way adjustable heated and cooled front seats, a 19-speaker premium audio system, and black exterior accents. Range Rover Sport Supercharged ($82,050) features the 518-hp V8. Autobiography Dynamic ($96,650) comes with the 518-hp supercharged V8 and soft-closing doors, three-zone climate control, a heated steering wheel, and 21-inch wheels. The Range Rover Sport’s tall, clean body lines and a wide stance convey a purposeful aura; it’s 2.2 inches lower than the Range Rover. Some of its design details come from the lines of the curvaceous Evoque. It has a sloped roof, stubby front end with nicely integrated headlights, smooth surfaces, and blacked-out roof pillars. Hood and fender vents suggest the Sport’s capabilities. Roof pillars are blacked-out, wheel areas are prominent, and the rear end is short. The SVR flaunts a more aggressive stance with its bigger wheels and tires. The two big touchscreens with the Touch Pro Duo system are canted toward the driver. Lo and behold there are dials, two of them that control different functions for the menu selected. There is also a volume knob. The top screen does infotainment, while the bottom screen handles the terrain management system. Chassis/drivetrain/engine modes are sport, comfort and eco; and off-road modes are snow, sand, mud, and rock or crawling. Each mode appears as an icon on the screen with its own beautiful tableau that allows deeper configuration, into the optional air suspension. Both rows of seats are comfortable, and the cargo area is large: 27.7 cubic feet behind the second row, and 62.2 cubic feet with it folded. Optional third row is cramped as expected. The fit and finish is excellent and the fittings top-notch. High-quality materials abound, whether leather, wood, metal, or plastic. If it looks like wood, it is wood. If it looks like metal, it’s metal. They all look great and feel good. Even the cargo area is attractively finished. In front it feels just like the Range Rover, with a big view of the road, but the Sport’s seats are a bit more cockpit-like. The second row isn’t wide, so two passengers are more comfortable than three there. The outboard seats are sculpted and supportive. There’s a good 37 inches of legroom. The supercharged 3.0-liter V6 is quick and responsive. It comes with 340 horsepower in SE and HSE, and 380 hp in HSE Dynamic. In the SE it will accelerate from zero to sixty in 6.9 seconds. The turbodiesel V6 is only a hair slower, gets five more miles per gallon, and brings bulging torque of 440 pound-feet. And it’s quiet. Range Rover Sports (except SVR) are rated to tow up to 7,716 pounds, and the turbodiesel is the engine for the job. The supercharged V8 makes the Sport flat fast. With 518 horsepower and 461 pound-feet of torque, it can accelerate from zero to sixty in less than five seconds, and with 575 hp in the SVR it knocks that down to 4.3 seconds. The SVR is loud and brash, sounding ready for the track. On the road it’s fully composed in curves, and turns long hours driving into comfortable excursions. As for off-road prowess, the Sport can cross creeks that are up to 33.5 inches deep, scamper over rocks, then blaze through sand or mud. Ground clearance of 9.3 inches, coupled with wheel travel greater than 10 inches, ensures rough-terrain readiness. Terrain Response 2, standard with V8 power and optional for the V6, provides seven modes for almost any surface (including Automatic), working transparently to deliver the greatest amount of traction. Rather than merely capable, the Range Rover Sport is among the easiest vehicles to drive under tough conditions. The Range Rover Sport can do it all, really really well. It’s a hauler, sports car, off-road vehicle, and luxury liner. You can’t find compromises, except maybe it doesn’t look much like a Miata. There are other similar-size SUVs you could buy that will work, but the Range Rover Sport has no real rivals. If you want it all, the Sport is it. Driving impressions by The Car Connection. Words by Sam Moses.